Research is expensive! Most ecology research is funded through grants, the largest of which are dolled out through the National Science Foundation (NSF), which, ultimately, is paid for by taxes. This means that every taxpayer, in a small but very real sense, is helping to pay for research on climate change, biodiversity conservation and ecosystem services. It’s a shame though that despite this financial connection there’s still a significant information-gap between the people paying for the research and the people making the discoveries. At best, after conducting research, scientists endeavor to educate the public through newspaper stories, blogs or even a televised interview. More often than not though the research gets published in an expensive journal using inaccessible jargon only to be read by other scientists. There are lots of institutional reasons why this isn’t going to change any time soon, but there might be another way of connecting people to research. With the social media revolution several “crowd funding” sites have sprung up. These sites rely on many people donating a little bit of money to help make something happen. Perhaps the most famous is www.kickstarter.com/ which funds everything from bands to inventors to aspiring fashion designers. 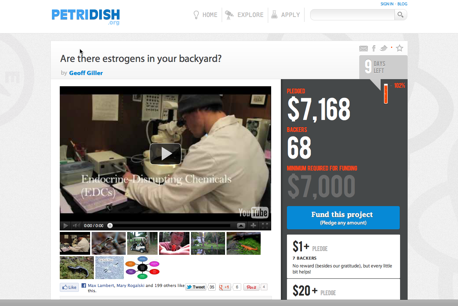 More recently, scientists have begun raising money for their research through science-centric crowd funding websites such as www.rockethub.com or www.petridish.org. Give them a look! Three of my friends at Yale have started online fundraisers for their research and they’re having tremendous success. Mary Rogalski is planning on resurrecting (you can do that?!?) aquatic invertebrates in mud cores taken from the bottom of lakes in Connecticut to get a sense of historical patterns in pollution. Max Lambert and Geoff Giller have another project looking at the effects of estrogenic chemicals on amphibians in our backyards! Together they have already raised over $8,000! I’m excited about the potential of crowd funding science because it’s a good source of money to fund research that is important but perhaps not grandiose enough for large, highly competitive grants. I’m even more excited about crowd funding though because it is an elegant way to get non-scientists involved in science. Between their two projects 80 people have already donated money and who knows how many more read through their descriptions. Engaging funders at the beginning of research could be an excellent chance to teach people about science as a process. By only presenting results after the research is completed, scientists have given the public at large a false sense that science is about fact-finding. This has been an overarching issue of the climate debate; scientists present the current state of the research, skeptics revel in the doubt inherent in the scientific process, and little headway is made. Instead, if we’re able to show more people the process of science, then, maybe, there will be greater understanding that research is incremental, that truisms are rare and that each result, positive or negative is a step forward. I think that by getting people engaged at the beginning of a project and then keeping them engaged throughout the research, crowd funding might be a terrific opportunity to both finance interesting research and broaden the discussion about science.